The IS-6 is a gift Rank IV Soviet heavy tank with a battle rating of 7.3. It was introduced in Update 1.67 "Assault". This is one of the most dreaded tanks of its BR spread since it features a good canon and awesome mobility packed inside an heavily sloped thick armor that most APHE shells cannot penetrate. Use this tank in any role and situation, it will surely find its place on the battlefield. The IS-6 features an upgraded version of the D-25T gun found on other IS series variants, the D-30T. Though identical ballistically, it provides a much faster reload, with the IS-6 having a default reload rate only 0.5 seconds longer than the T-10M. The IS-6 uses the same ammo load as the IS-2 with the best shell being the BR-471B, which means the tank will have trouble against some heavies it may encounter from lacking penetration. In addition, the IS-6 does not have access to the BR-471D, which is usable on the IS-3, also at 7.3 rating. 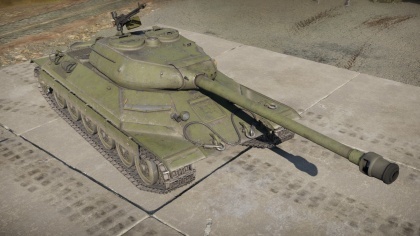 If used well, the IS-6 can get into position as fast as a T-54. It is certainly one of the fastest late IS-series tanks. It reaches 44.3 km/h (27.5 mph), the top speed in RB, with ease and has a reverse speed of 16.1 km/h (10 mph). 100 mm sloped at more or less 60­° on all sides provide this vehicle with a reputation to be a ricochet master. Firing on the hull from almost any angle will only result in a glancing shot. The only weak spot being the lower sides of the hull and turret sides and rear, the only way to reliably penetrate it is to get a shot from the side. An attentive player that never shows the sides is an invincible opponent. However, be aware of your frontal armor, as the extremely angled turret armor encasing the cannon breech can create a shot trap and ricochet the shell into the driver's area. This will likely result in your ammo exploding. Be wary when facing any opponent. The left hand side of the turret mantlet is also a small weakspot, hard to hit but devastating if you take a shot there. A shot to the this part of the mantlet will destroy the cannon breach as well as knocking out both the gunner and commander, and it also has a chance to detonate ammo if there is any in the back of the turret. Suspension wheels are 20 mm thick while tracks are 30 mm thick. Torsion bar connectors by the wheels are 60 mm thick. Spaced armour plates are placed on the sides, giving an additional 10 mm of side armour. 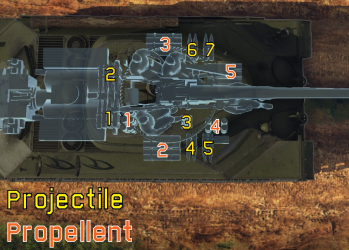 From the front, only high-end rounds (HEAT-FS, HESH, APFSDS) can penetrate the IS-6. Otherwise, flank it since its lower side armour is unangled behind the tracks. In a close to medium range fight, if the IS-6 is static and facing you, try to shoot its right side turret cupola, a penetrating APHE shell may knock out the commander and gunner, disabling the tank (some large calibre rounds can even knock out the loader and/or driver, resulting in an instant elimination). This strategy is unapplicable with rounds that don't have HE filler. Another weak spot is the left side of the mantlet which has the optics in it. This part of the armour is thin enough that most shells at the BR can penetrate it, and in doing do, incapacitate the commander and gunner and destroy the cannon breach. If you are lucky and the IS-6 has ammo in the back of its turret, there is a chance to detonate it as well for an instant elimination. If you happen to flank an IS-6, take the time to aim since half of its side is covered by its dreaded armour. A missed shot will alert the IS-6 player, withdrawing with its fast speed from sight before another shot could be landed. Turret sides and back can ricochet rounds as well, so keep the hull as a priority target. If encountering this foe from its back, keep in mind to aim for the middle of the engine deck since plates on both sides are as though as their frontal counterparts. If confident, go for it and aim at the turret back. Any round penetrating the crew compartement leads to an ammo rack detonation most of the time since this tank's interior is filled with ammo all over the place. Ammo racks of the IS-6. The Chelyabinsk Kirov Plant Work (ChKZ) began planning a draft of a new heavy tank on 02 May 1944 with an electrotransmission, a drive system seen on the German Ferdinand/Elefant. The plant was officially ordered to begin work on June 08 for two versions of the heavy tank, with emphasis of having significant advantages over the IS-2 heavy tank. The heavy tank was designated as the IS-6 and the two versions were the Object 252 with a mechanical transmission and the Object 253 with a electric transmission. Both prototypes were produced in the Fall of 1944 and were sent to be tested at the NIIBT testing grounds at Kubinka. The two prototypes differed in more ways than just the transmission. Object 252 used the mechanical transmission from the IS-3, with large road wheels and no track rollers for its torsion bar suspension. Object 253 uses an electric transmission with a suspension that looked similarly to previous IS iterations with smaller road wheels and track rollers. The IS-6 prototypes failed to stay under the weight of the IS-2, being around 51.5 tons. The 122 mm gun arming the IS-6 was the D-30, compared to the D-25T on the predecessors. The D-30 implements features such as the D-25's monobloc design, the 100 mm D-10's breech and gas block, a two-spring balancing mechanism, a lengthened D-25 mount, and a fume extractor. This gun was installed onto the IS-6 prototypes in December 1944. 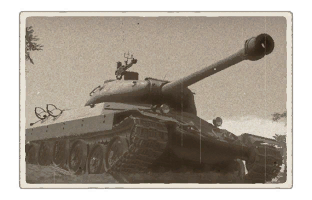 The IS-6 prototypes were tested alongside the Object 701 (the prototype of the IS-4). The two IS-6 prototypes proved disappointing, with the Object 253's electric transmission being too complex, expensive, and unreliable. The Object 252's mechanical transmission also suffered from reliability issues. Suspension problems also impacted the IS-6, with its speed dropping below the heavier Object 701. It was hoped that the electric transmission would help make the tank more maneuverable, but the heavy weight prohibited any vast improvements. Overall, the IS-6 armour was deemed to not provide any improvements over existing designs, having only comparable armour, firepower, and mobility to the IS-2 and IS-3. In 1945, all work on the IS-6 ceased as work continued on the Object 701. ↑ TankArchives 2016, "Launch of the IS-6"
↑ 5.0 5.1 5.2 TankArchives 2016, "Object 257"
Boldyrev, Eugeni. "Last Heavy Tanks of the USSR." The Russian Battlefield. N.p., 18 Sept. 2011. Web. 08 Jan. 2018. Website. Kinnear, James, and Stephen L. Sewell. Soviet T-10 Heavy Tank and Variants. N.p. : Osprey Pub, 2017. Print. TankArchives. "D-30 Gun for the IS-6." Tank Archives. N.p., 19 Sept. 2013. Web. 08 Jan. 2018. Website. TankArchives. "Electrical Transmission." Tank Archives. N.p., 02 June 2014. Web. 08 Jan. 2018. Website. TankArchives. "Object 257: The First IS-7." Tank Archives. N.p., 12 June 2016. Web. 08 Jan. 2018. Website. TankArchives. "Launch of the IS-6." Tank Archives. N.p., 20 Dec. 2016. Web. 08 Jan. 2018. Website. This page was last edited on 6 February 2019, at 01:22.